Doctor Who All Star Cast - Who's Confirmed? My fellow geekians. 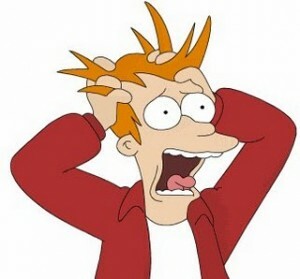 I have taken this time to put the metaphorical pen to paper and share with you my recent experience. Upon falling ill and having to glue myself to my bed with nothing but my laptop for company, I was told to watch a quite famous TV show amongst the geek population, ripped from our hearts so prematurely. A confession which I must admit to is not watching this programme sooner; forgive me. I was blind, but now I see. I will actually take this opportunity to thank my fellow Geek Pride contributor Mr James Buckingham for suggesting I use my down time to watch this show. Having never seen it before, I started watching with a curiosity which eventually turned into love and a somewhat unpredictable hatred for the Fox network. I am of course talking about Firefly. Most of you would have already deciphered this from the title of this blog alone. For those of you who are also new to the series, whether you missed it when it was originally aired or being like myself, a fairly new, naive geek, then let me give you a quick run-down of what the show is all about. Firefly is an American made, space western drama created by Joss Whedon. It consists of 14 episodes and one feature length film. Firefly is set in the year 2517. After the Earth was used up, the humans moved to a new star system, terraforming the surrounding planets. We follow the crew of “Serenity”; a firefly-class spaceship and the adventures they are faced with whilst trying to make a living on the outskirts of the “unified” society and trying to stay under the radar of the Alliance; the central federal government. Nine people make up the crew and as Joss Whedon himself said, “They are nine people looking into the blackness of space and seeing nine different things”. So, now you are all caught up on what Firefly is and how I came about it, I’d like to give you my top eleven reasons why I fell in love with the show. Yes, eleven. Well, why have ten, when you can have eleven? Here we go! As we follow the Serenity crew, we come to see them in a light that can only be described as a good one. 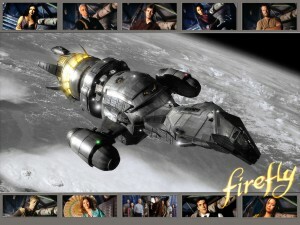 However, in reality, in the Firefly reality, they are the renegades, the rebels, the ones who should not be trusted. For me to think anything bad about any member of the crew would go against every fibre in my body. The show portrays the bad guys as the good guys, and the so called good guys, the Alliance, are a far worse evil once the surface crust of perception is broken. Many planets are united under this central government, under their rule, and the few that defy them are cast out onto the outskirts of society, making a living using underhand techniques and illegal tradings as this is the only way they can make money. On the run from the law, not living by anyone’s rule except that of the Captain. I guess for me, the line of good guy and bad guy is blurred almost to an indistinguishable level. The fact that most humans are unaware of the horrid acts caused by the Alliance makes them to be the perceived good guy in the light of the majority when as we know, they are in fact the face of evil and the minority, the crew of Serenity, are a beacon of hope in an otherwise brainwashed nation. The theme song is a wonderful mixture of guitars, violins and a voice that would make chocolate melt. It reminds me of a classical western drama, but mixed in is the sounds of spaceships swooshing by, making it a magnificently perfect theme song. It gives you a feeling that whilst there is adventure and voyages, there is also sentimentality to the song which reflects the relationships that are born upon Serenity with a finesse that only a genius can accomplish. The new star system has a brilliant mixture of different planets; from those that are technologically advanced (clean, sterile) to those that are within the poorest regions of the system (horse drawn carts and mud), it creates a believable environment for the Serenity crew to travel through. Even the smallest part of a planet is thought out thoroughly to make it look real, plausible and believable. My personal favourite environment is that of the Serenity ship. This is where most of the filming is done and while it is clearly a ship, a vessel that travels through space, it is also made homely. Little touches around the ship from Kayleigh’s stickers on her bedroom door to the dinosaurs that Wash plays with at the beginning of the season, it is a home for the crew and as the season goes on, it becomes a home for us. I’m not the most technically minded person. I can’t recognise what type of software was used to make the ship fly through space or what was used to make the hologram brain scanner, but what I do know is nothing looks out of place. The CGI/graphics help to create a world that some geeks come to love so much. A world in space. Spaceships, technology that only dreams can make work and cities as big as New York, all made on a single computer. 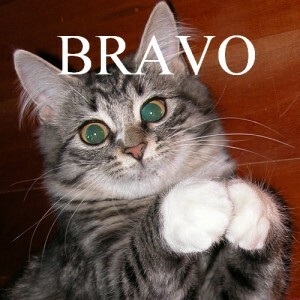 Well done, is what I will say. Bravo. I watched 14 episodes back to back and then watched the film without my eyes leaving the screen. In each episode a new adventure is born, along with the ever present threat of the Alliance. If you watch this programme, you will not be bored for quite some time. Taking out all aspects of the show, and stripping it back to the bare bones of storyline, it holds up all on its own. As said in my introduction, a crew, nine in number, adventure on the borders of a society they have never fit in to, and in some cases, actively opposed to during the war times. Making a living using illegal measures, they must keep under the radar of the federal government, flying into the face of danger with a fearless heart. A strong storyline for a strong show. Whilst I did sit there biting my nails at times, I didn’t sit there with my heart threatening to jump out of my throat or suffering a stroke. The tension of each episode is perfectly balanced with mystery and reveal. We are left in suspense for the right amount of time, we are given the answer at the right time and we are given just enough information to want more. For a drama show, I laughed a lot. Not in the ‘oh-goodness-this-is-so-bad-it’s-funny’ way. I laughed in an ‘oh-goodness-this-moment-in-time-is-damn-funny’. The humour is set out in such a way that the smallest of moments makes you laugh uncontrollably for five minutes straight until your sides hurt and you’ve snorted cola all over your laptop (this didn’t happen… *whistles innocently*). The humour not only is well written by the writers of the show but the way it is portrayed by the characters and the actors that play them. I started watching the first episode and squeeled. Nathan Fillion! Yes! Alan Tudyk! Yeeeeeessss!!! While the others I had never heard of, each actor portrays their character flawlessly. You fully believe in the character they play and you become emotionally attached to each one in their own way. The whole world, despite all the effects and side characters that are magnificently portrayed, the programme would have been nothing if it weren’t for the main cast; Nathan Fillion, Gina Torres, Alan Tudyk, Morena Baccarin, Adam Baldwin, Jewel Staite, Sean Maher, Summer Glau and Ron Glass all come together to make a perfectly portrayed crew of renegades. HE WAS A LEAF ON THE WIND! A LEAF! 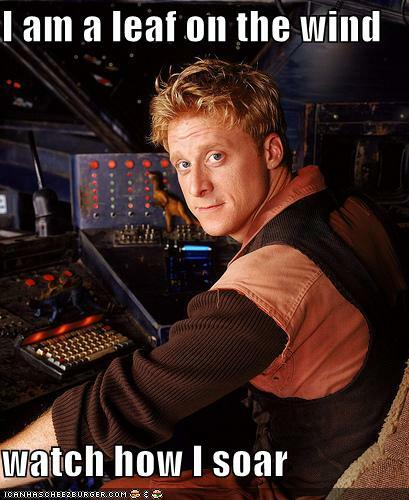 Alan Tudyk, apart from being an amazing actor anyway, couldn’t play Wash any more perfectly than he does. I won’t spoil it for anyone who wishes to rush out and watch this series after reading this (it’s on Netflix by the way), but I was shocked and upset by what happened. HE IS A LEAF ON THE WIND! Of all the characters, I got the most attached to him. He was my favourite out of all of them. From the moment I saw him on screen playing with his dinosaurs, I knew that we were going to get along just fine. A wonderful character created by a genius writer, played out by a prodigy of an actor. He was my favourite character of the show and film, and will always be my favourite until the day I die. I do. I get it. I think I realise why I like space related programmes so much. A crew are forced together in a confined space and they become a family, loose nuts and screws included, and let’s think for just one minute, isn’t that all we want out of life? A family, no matter how dysfunctional? As I watch the crew interact it makes me all warm inside and makes me realise that yes, someday, you will find somewhere you belong. So, there you have it. 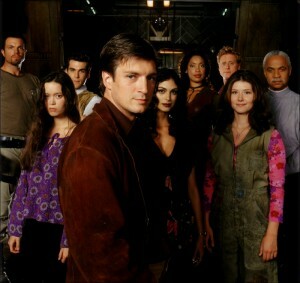 Top eleven reasons why I love Firefly. You could also use them as the top eleven reasons why it shouldn’t have been cancelled and why Fox are complete dicks but that is another story altogether. I now understand the passionate hate that boils in people’s stomachs when they think about the heartless nature in which Firefly was taken from us. However, I just wanted to say one more thing. Enjoy the show or not, seen it or not, this blog wasn’t to try and win over more fans or make people hate Fox. This was just a blog to show how much this TV show has impacted me as an individual, and I wanted to share with you, as a fellow geek, how much this show now means to me. As Simon Pegg says, “Being a geek is all about being honest about what you enjoy and not being afraid to demonstrate that affection. It means never having to play it cool about how much you like something. It’s basically a license to proudly emote on a somewhat childish level rather than behave like a supposed adult. Being a geek is extremely liberating”. And that is what I wanted to do, and I hope that I succeeded in my objective. Thank you for reading. Live long and prosper.